This Promising Practice arose from the work of EENet’s Racialized Populations and Mental Health and Addictions Community of Interest (CoI). The goal of this CoI is to strategically leverage existing or emerging evidence (including community-based, lived experience, peer-reviewed academic, and other sources of knowledge) to improve provincial, LHIN, and provider policy, planning, and practice related to racialized populations and mental health and addictions. Through a series of knowledge exchange activities, the COI has identified promising practices related to mental health-related emergency room (ER) use by racialized populations in Ontario, with an interest on emergency department diversion. For more information, and a list of the CoI’s partners, please click here. How does a community health centre meet the health care needs of racialized women from diverse backgrounds? If you ask Notisha Massaquoi, Executive Director of Women’s Health in Women’s Hands (WHWH), it’s by playing a balancing act. The trick is to have a strong mandate and establish the right partnerships, while also remaining flexible to your clients’ changing needs. Read about WHWH in this issue of Promising Practices, developed by EENet’s Racialized Populations and Mental Health and Addictions Community of Interest (CoI). The goal of this CoI is to use the available evidence (including community-based, lived experience, peer-reviewed academic, and other sources of knowledge) in a strategic way so as to influence policy, planning, and practice related to racialized populations and mental health and addictions. Through a series of knowledge exchange activities, the COI identified promising practices relating to mental health-related emergency room (ER) use by racialized populations in Ontario. 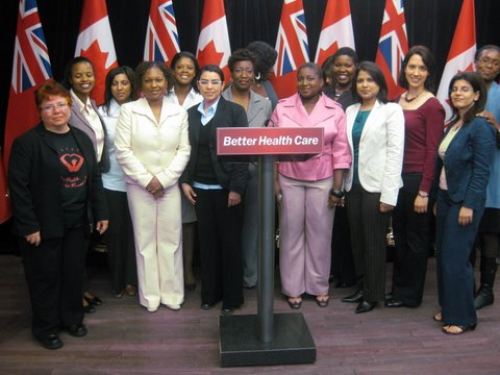 How does a community health centre meet the health care needs of racialized women from diverse backgrounds? If you ask Notisha Massaquoi, Executive Director of Women’s Health in Women’s Hands (WHIWH) it’s by playing a balancing act. The trick is to have a strong mandate and establish the right partnerships, while also remaining flexible to your clients’ changing needs. WHIWH serves women of diverse backgrounds from around Toronto that specializes in the health and wellness needs of racialized women. It serves a large proportion of women from the African, Caribbean, Latin American and South Asian communities. The chronic condition that brings the most number of women to the centre are mental health related, with depression being the most prevalent. According to Notisha, the primary healthcare team noticed that a significant number of the women they were referring for psychiatric care were showing up in crisis at a later date at the Centre for Addiction and Mental Health (CAMH) emergency department. The referral services available were not culturally and linguistically appropriate. The hospital would provide education and support to the primary care physicians and staff at WHIWH, building their capacity to work with those clients who need mental health services. The hospital’s psychiatry residents would have the opportunity to build their cultural competency skills serving a community of clients from diverse backgrounds and with complex mental health needs. In addition to the partnership with Women’s College, WHIWH also was able to secure a CAMH psychiatrist to work on-site through funding provided from the Toronto Central Local Health Integration Network (LHIN) for psychiatric sessional services. In terms of working with racialized populations and mental health issues, you’re not just dealing with the condition(s) itself, but you’re also dealing with the stigma that the community carries as well as the history the community has with psychiatric services in Toronto, Notisha explained. So at WHIWH, they began bridging the barrier between the mainstream service and the communities. None of the centre’s successes would have been possible without these partnerships, Notisha stressed: it allowed the centre’s mental health services to grow from just one resident, to establishing a shared care model, to having a psychiatrist on-site weekly who supervises the residents and provides specialized treatment. “It’s a lot of people realizing there’s a gap here and this works, so let’s make it sustainable,” Notisha says. The program, which started in 2008, has been extremely successful. It has decreased the number of psychiatric emergency visits from WHIWH clients by more than 60%, and it also helped to reduce costs for non-insured services, which is anticipated to rise due to federal government cuts to the Interim Federal Health Program for refugees. The CAMH psychiatrist who works regularly at the centre, Dr. Alpna Munshi, brings to her position her own personal experience as a member of one of the communities that WHIWH serves. She started at the centre through residency program, then realized that the arrangement could – and should – be more permanent, and made a commitment to work at the centre once after she graduated. She also helps the centre’s primary care physicians build their capacity to treat women with mental health issues and supervises the steady stream of residents from Women’s College. Her client load is very demanding, indicating that there’s an enormous need for the service. The centre’s clients, who were not willing to access mental health services outside of an environment they know, from fear of stigma, are now able to receive care in the community setting that they trust. An in-house psychiatrist who can provide culturally-competent mental healthcare. Institutional support from Women’s College Hospital, Across Boundaries and CAMH, which has been doing innovative work on models of care for communities of colour, racialized populations, and newcomers. Consistent funding from the Toronto Central LHIN. Educational support for WHIWH’s primary care physicians. Commitment from all partners to the WHIWH mandate – to address the needs of clients from the perspective of gender and race as determinants of health. An important aspect of the partnerships’ success is that the framework was set out clearly from the beginning. So WHIWH’s mandate – an inclusive feminist, pro-choice, anti-racist, anti-oppression, and multilingual participatory framework – is non-negotiable. Every single client deserves the best care possible, and every door is the right door. The shared care model is an effective way to increase access to mental healthcare through community health centres as well as building capacity. If you’re interested in discussing a partnership with Women’s Health in Women’s Hands, or want more information, contact Notisha Massaquoi, Executive Director at notisha [at] whiwh [dot] com.